There has never been available a compilation of information on steel estimating such as this one in the entire history of steel fabrication. Designed to provide enough information to train someone new in all the aspects of becoming a steel estimator, this manual is ideal for anyone who wants to learn how to become a steel estimator, as well as anyone who wants to learn the entire process including many trade secrets. 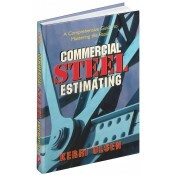 It is a must have for architects, engineers, general contractors, owners and developers that need to know about steel. Contains all the basic requirements of the steel estimating trade in specific detail. Uses a bid set of construction plans and specifications and explains each element of producing a bid from these construction documents. Provides unique information on shop fabrication labor and how to apply that labor to fabricated parts.